The rain and cold of Adria might have given Kart Republic a hard time but still not enough to cool their ambitions in this year’s WSK Final Cup! With Taylor Barnard walking off with the title in the Junior class and Lorenzo Travisanutto adding a Senior win to his recent FIA Karting World championship crown, the “Rosberg Racing” colors have shone through the storm to prove once again that the Italian squad is more than ever one of the strongest performers on today’s international karting scene. , Adria, 25 November 2018. WSK Final Cup, © 2018, Alexandros Vernardis / The RaceBox. The least we can write is that luck hasn’t been at Travisanutto’s side on Sunday for two of the three rounds in this year’s WSK Final Cup. But the 19-year-old Italian driver has finally managed to turn things around to his advantage. In Lonato, it had all started well, though. Less than a month after claiming his first World Championship title in Kristianstad, Sweden, Lorenzo switched to WSK with a fresh mind to dominate the first round in the OK class, showing an impressive pace materialized by a Pole position, three Qualifying Heats, the Prefinal and the Final all falling into his pocket. “After the World Championship in Sweden, this win feels like a relief”, he declared at the time, already pulling a 27-point gap over Kas Haverkort in the standings. Then, came the second round in Castelletto di Branduzzo. In the wake of his first weekend, Travisanutto didn’t fail to keep his winning momentum going on the 7 Laghi Kart Circuit. Fastest again in Qualifying on Friday, he cruised through the heats with the most points scored (11) before securing Sunday’s pole position by winning the Prefinal A. 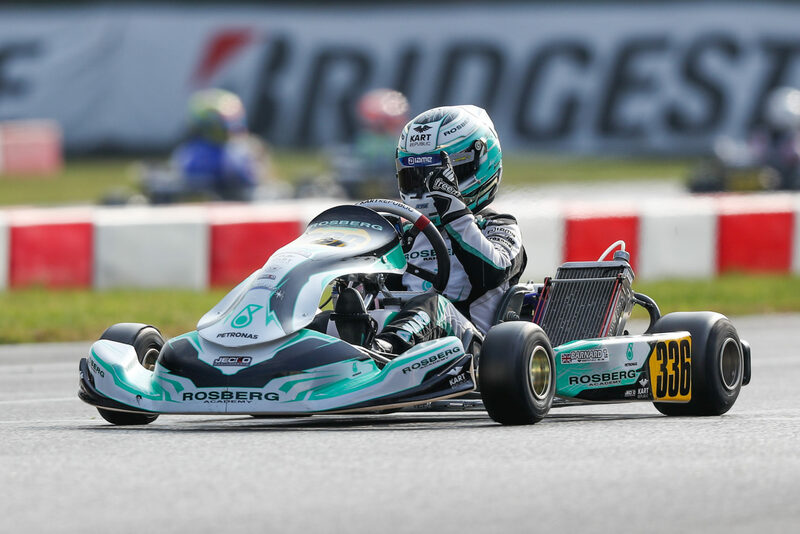 But another “walk in the park” it would not be for the Rosberg Racing senior when a technical issue hit in the second lap of the Final, forcing him to an early retirement with no points scored. “An electric issue while leading the race definitely ain’t gonna make your Sunday, but that’s racing,” he had shared afterward on social media. A deception that opened the door to his teammate Dexter Patterson who found the pace to get past Leandro Anderruti to take the victory. An encouraging sign proving that, even in adversity, Kart Republic could count on its squad to make up for the occurring bad luck. Despite the blow, Travisanutto kept the lead and even extended it to 32 points on Patterson, promoted to second after Haverkort failed as well to score that day. In Adria, for the third and last showdown, Travisanutto was willing to keep the pressure high on his opponent’s shoulders. And so did he, despite missing the fastest-lap on Friday (to Andrea Rosso), with three heats in the bag and Sunday’s pole after defeating Rosso in the Prefinal A. But karma hit again at the worst moment when he was forced to retire two laps from the chequered flag, missing what could have been a potential podium-finish behind Rosso. Despite his second retirement in a row, Travisanutto could count on his Lonato win and a string of strong results on Saturdays to savor his victory in this year’s Final Cup – OK, won in front of Kas Haverkort, 19 points short despite a good Adria weekend that saw him finish runner-up to Rosso. Alongside this year’s race victors Lorenzo Travisanutto and Dexter Patterson, who ended up 6th in the overall standings, the other KR chassis representative in the top ten is Leandro Anderruti, 3rd, with a second place in Castelletto as his best personal result. As in the Senior class, Kart Republic has been able to secure two wins out of three races in this year’s Cup, only defeated in Adria by Gabriele Mini’. Unlike Travisanutto, the first round of Lonato didn’t take off quite easily for Taylor Barnard who struggled to find the pace he wanted. Despite a fourth-best lap time in Qualifying, the heats turned out to be eventful for the young Brit who dropped to 7th in the provisional classification on Saturday night. Still, Barnard had seemed to have got up on the right foot the following morning as he won the Prefinal A to head for the Final in the Pole-sitter’s shoes. This time around, he took full advantage of the situation thanks to a clean get-away start, helped by racing drama further back when 15 drivers got caught up in diverse incidents. Up front, there was nothing to worry about for the KR driver who firmly held his position to take the chequered flag while his newly-announced teammate Andrea Kimi Antonelli finished in an encouraging fourth position. Since he claimed the first round, Barnard was logically the one driver to keep both eyes on. And at Castelletto di Branduzzo, host of the second round, the Brit didn’t disappoint by setting the second fastest lap of his qualifying group before winning two of his four heats on Saturday. 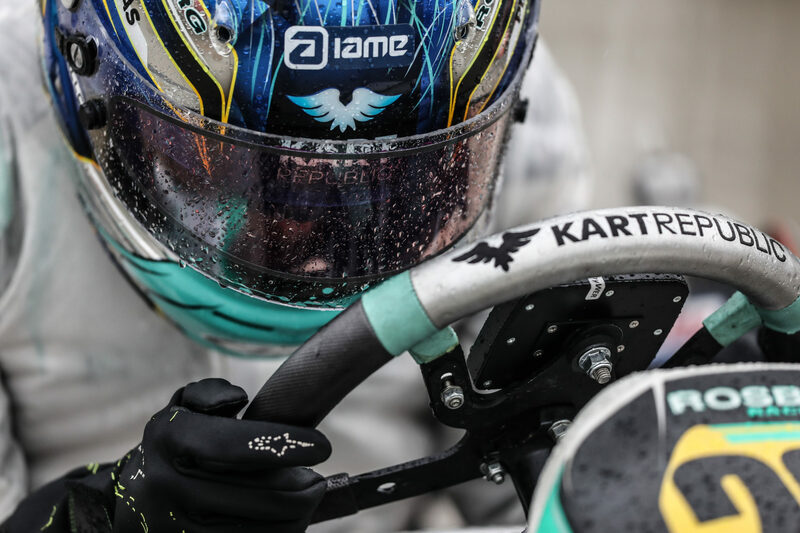 Still, a 5th and a 6th finishes made him miss the first row of the Prefinal A that he nevertheless won to start on the front row of Sunday’s final grid alongside his equally-fast teammate Marcus Amand. Determined to recover from a 13th-finish in Lonato, Amand struggled in the opening stages of the race before hitting the magic button to pull away in the lead not to be reached again. Meanwhile, Barnard got caught up in a heavy explanation that made him lose precious time against other drivers including Laurens Van Hoepen, Dilano Van’t Hoff, Andrea Kimi Antonelli, and Gabriele Mini’. Despite a 6th place at the flag, he had collected enough points to keep the provisional lead in the overall rankings. With Amand, second overall for three points but retained for the final race in Adria, Barnard still had a 51-unit mattress on his closest rival Kirill Smal. On the International Raceway, not only Smal but Mini’ emerged as strong contenders, the Italian especially willing to make up for two difficult weekends where he only collected 63 points compared to Barnard’s 143. Winner one three Qualifying Heats on Saturday, Mini’ put himself on pole for Sunday’s Final thanks to a win in the Prefinal B, imitated by Barnard in the Prefinal A to grant him a spot on the front row. Mini’ quickly took his chances for the win as he built a 2.6-second gap over Smal who clinched the second spot in front of James Wharton. In the middle of a close pack in the latest stages of the 12-lap race, Taylor Barnard couldn’t get past the Australian but retained Antonelli behind him to secure the 2018 WSK Final Cup – OKJ title, 41 points ahead of Mini’, whose late win had promoted him to second, and Smal, author of a strong weekend in Adria, both overtaking the missing Amand, fourth, ahead of Antonelli, fifth overall and the third KR chassis representative in the top-5 of the Junior class. 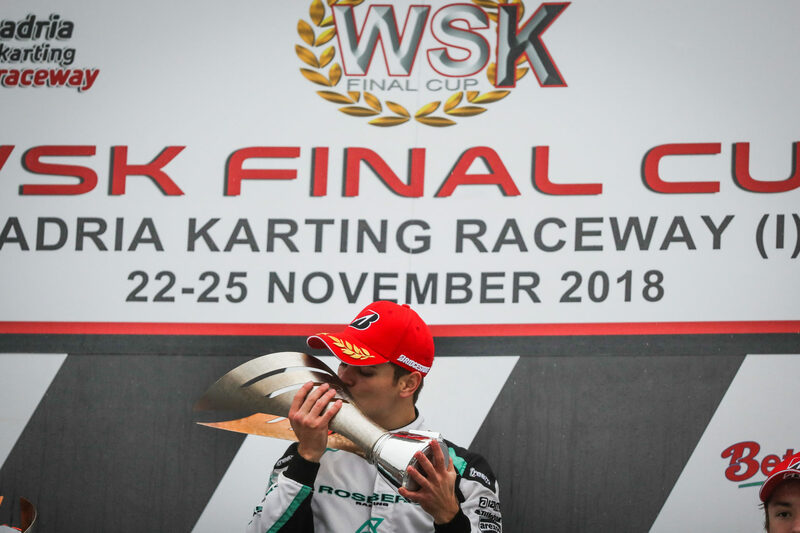 With four wins (Travisanutto and Barnard at Lonato, Patterson and Amand at Castelletto) for two classes won, Kart Republic has undoubtedly left its winning mark on the 2018 WSK Final Cup, adding one more trophy to their 2018 already-impressive record that includes the IAME Winter Cup (Janker), the WSK Super Master Series (Janker), the OK European (Janker) and World (Travisanutto) Championships plus a silver medal (Dreezen) at the KZ World Championship. 336,Barnard Taylor(GBR),Kr motor sport(KART-REPUBLIC/PARILLA/), Lonato, 21 October 2018. WSK Final Cup, © 2018, Alexandros Vernardis / The RaceBox.